Lucretia Rudolph attended Western Reserve Eclectic Institute (now Hiram College), a school co-founded by her father. From her papers, we know she had an interest in genealogy and literature, women’s rights, and her church, the Disciples of Christ. Her romance with James Garfield, the man who would be her husband and America's 20th President, was much deeper in their letters than in person -- on paper, they confessed their deepest emotions, but their time together went awkwardly. She wrote that she felt his proposal was out of "duty", not "passion." After their wedding, he was gone so frequently that in their first six years of marriage, she calculated that they had spent about six weeks in each other's company. He admitted to at least one extramarital affair, another was suspected, and there were quite possibly others unknown. As her husband's political career progressed, however, either their marriage grew stronger or their public image as a happy couple was more skillfully crafted -- by the time he ran for President, they were reportedly "inseparable". 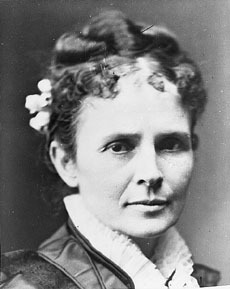 When he was elected, she was not terribly interesting in being America's hostess, but she participated in society dinners and twice-weekly receptions. Her time as First Lady was brief. After only a few weeks at the White House, she became ill, supposedly with malaria, and was sent to a seaside resort in New Jersey for recuperation. She was still there a few months later, when she received word that her husband had been shot. She returned to Washington, where, for the next two months, his doctors did what little they could. Medicine was primitive, though, and as the doctors tried to extract the bullets by digging through the President's wounds with their unwashed fingers, they inadvertantly caused the infection that actually killed him. The widow Garfield then returned to the family farm in Ohio, where she lived the remaining three and a half decades of her life far from the public eye. Winters she spent in Pasadena, where she died in 1918.